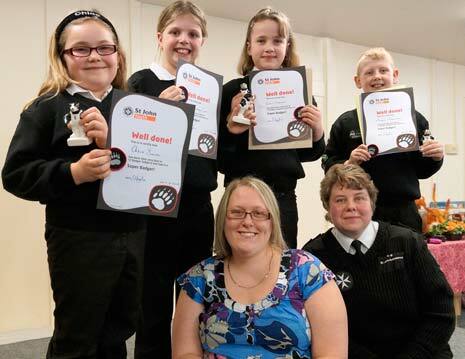 Cadet Carol Owen was just 19 when St John Ambulance launched its Badger movement for the under 10s. She set up one of the first Badger Setts in the country, at Bolsover - and this week she led the group's 25th anniversary celebrations. Carol Owen (front right) and Louise Wright with Super Badgers (from left) Chloe Smith, Cora Murray-Carr, Ellie Dawes and Morgan Hopkinson. The presentation evening last night (Wednesday, 7th March) was a chance to congratulate high achievers and to thank those who have supported the group over the years. That includes Carol's mum, Rosemary Owen, who stepped in to help run the Badgers 20 years ago and has been there ever since. A highlight of the evening was the presentation of Super Badger Awards - the organisation's highest possible achievement - to Morgan Hopkinson, Chloe Smith, Ellie Dawes and Cora Murray-Carr, all aged 9. The awards were presented by Louise Wright who was a founder member of Bolsover Badgers back in 1987 and the first to become a Super Badger. Carol has been a member of Bolsover Division since she was 10. Her Badger group began with 20 members and quickly grew to 30. For 9 years, she ran two 'Setts', but these were later merged and she now has 40 Badgers - and a waiting list! Carol said: "I love what I do and it's certainly become a part of my life over the years. Our aim is to equip children with valuable life skills; even a 5-year-old can be the difference between a life saved and a life lost. But we also have lots of fun, with outings, theme nights and activities that count toward badges and awards." Anyone wanting to know more about becoming a Badger should contact St John Ambulance on 01246 200272. Two Bolsover St John Ambulance Cadets have won royal recognition for their achievements during an official reception at Buckingham Palace.